Internet of things (IoT) trend is reshaping financial industry. 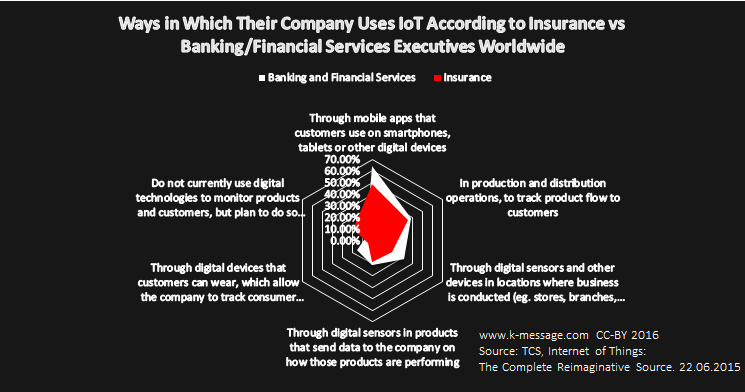 Learn about IoT in finance and banks, see examples of IoT in financial and bank marketing. Read also: IoT in Pharma and Healthcare Industry. Internet of Things (IoT) is a technological trend. It describes a network of objects enabled with electronics, sensors, software and connectivity allowing them to be interconnected via internet. IoT allows buildings, cars, watches to become “smart”. IoT in financial services and banking has been embraced even before its definition. Examples are biometric scanners in ATMs, connected devices in insured cars finally. Mobile devices: smartphones, tablets and smartwatches are now the most widely recognized applications of IoT in bank and financial services industry. The progress in technology allows much wider application going far beyond simple communication with consumers. Example: A beacon at the door may recognize customer’s mobile phone or RFID card and offer customized cashback offer at the shop. Example: Effortless no touch cashless payment using RFID scanner to identify products in the shopping cart and mobile wallet. Some of those promises lead us to the next topic: obstacles and barriers to full implementation of IoT in financial services and bank marketing. According to TCS report from June 2015 includes a survey of global executives across a variety of industries. Respondents in banking and financial services predicted that average IoT per-company spending for their sector would grow to $153.5 million by 2018, up nearly 31% from $117.4 million in 2015. Respondents in the insurance industry expected their average per-company budgets to rise about 32% between 2015 and 2018, from $77.7 million to $102.9 million. In August 2015 similiar poll has been conducted by IDC. According to this study 58.4% of finance-industry decision-makers viewed the IoT as a “strategic” initiative, compared with 20% who believed it was “transformational.” Perhaps more significant, only 5.6% of respondents said it was unimportant. There is no doubt, that the growth of IoT in banking and financial services will be supported by following factors. The growth may be slowed by regulatory compliance especially in data privacy, but is unevitable. Below we list examples of IoT in banking and financial services that clearly show competitive advantage and clear valur proposition of IoT offered to bank and financial services consumers. Visa Mobile Location Confirmation is an optional service for consumers that will be offered through participating financial institutions’ mobile banking applications. The service uses mobile geo-location data in real time as an additional input into Visa’s predictive fraud analytics. Finsphere Corporation, a leader in the use of mobile data and geo-spatial analysis, provides Visa an analysis of the account holder’s device location data, which is then matched with the transaction location in less than a millisecond, right at the point of sale. When a cardholder’s mobile device is in the same location as the payment transaction, the issuing financial institution can more confidently approve the transaction. Alfa-Bank Sense is an advanced mobile application providing real time predictions of customer behavior offering the services they might need. It’s more gentle and personal than the ordinary bank app and communicates like Facebook Messenger. See also previous Alfa-Bank innovation using wearable fitness trackers.
. It allows effortless purchasing groceries while standing in front of the refrigerator. The purchase is served by FreshDirect or ShopRite e-commerce platforms. The payment from MasterCard goes through NFC technology served by Coin, the company recently purchased by Fitbit. What are your thoughts of IoT in banking and financial services? Do you know other creative implementations? Do you plan any? Let us know in the comments or by email!